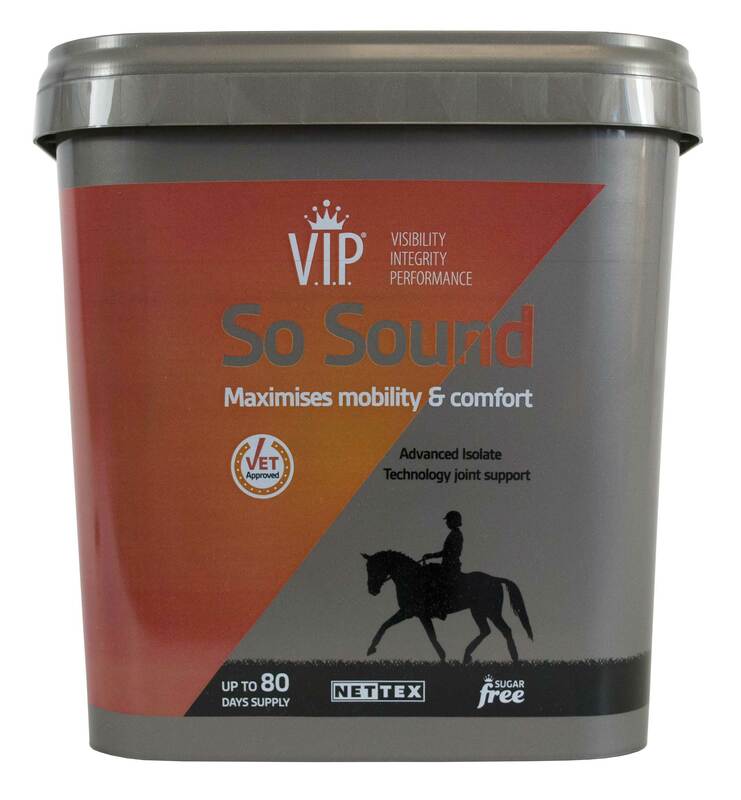 Nettex VIP So Sound's formula works synergistically to provide highly bioavailable joint and muscle support to maximise mobility and maintain soundness. Glucosamine and chondroitin have long been known to be beneficial as building blocks of joints, however the inclusion of five isolates in So Sound means that less of the parent compound is required to gain the same effect. The synergy of joint support, bone structuring compounds, L-Arginine AKG for lean muscle growth support and herbal extracts for comfort will help your horse stay So Sound. GLUCOSAMINE HYDROCHLORIDE PLUS 5 ISOLATES - Advanced isolate technology for optimal bioavailability. Glucosamine helps cartilage act as a shock absorber. CHONDROITIN SULPHATE PLUS ISOLATES - Advanced isolate technology for optimal bioavailability. Chondroitin helps maintain healthy cartilage and joint fluid. MSM - Bioavailable form of sulphur, which is essential to maintain healthy cartilage. HA - The key constituent of synovial fluid needed for joint lubrication. L-ARGININE AKG - Amino acid to support lean muscle growth. CURCUMIN (ACTIVE INGREDIENT OF TURMERIC) & BROMELAIN - Herbal extracts to support comfort and maximise mobility. VITAMINS C & E - Vital antioxidants to support joint health. CHELATED ZINC, MANGANESE & COPPER - To support joint health. Regular exercise creates ‘use trauma’ which can trigger arthritis. Research has shown that a lack of key nutrients during periods of wear and tear can reduce the ability for cartilage to repair. So Sound provides V.I.P.® care for your horse’s joints, maximising comfort to maintain mobility and flexibility. So Sound does not contain Devil’s Claw.